On 3 July, I began writing the first draft of my thesis. My aim is to complete the draft by Christmas. This gives me a very tight schedule so I need to micro manage my time. To see how I use my time, I decided to embrace my addiction to Twitter rather than turn off my smart phone. My first day, I used the hash tag #tweetingmythesis to see how I used my time. The following is a little bit auto-ethnographic and a little bit meta-cognitive. Warming up for the day always needs a coffee! I felt quite nervous about starting because I had written nothing technical for my PhD for 12 months. Free writing was a technique suggested in one of the Griffith University research higher degree workshops. I have used it for years in my pedagogy. This first day of writing, I used it to break the ice. Free writing is a technique where you write stream-of-consciousness about a question for a short amount of time. You may not stop typing or lift your pen from the page. You must write down everything that crosses your mind: answers, distractions, environment. You must keep writing. Do not stop until the time is up. If distraction occurs, indulge it but gently bring your mind back to the question at hand. Do not edit. Do not write in sentences. Do not concern yourself with grammar. The point of free writing is to free your thinking from structures like sentences and spelling and allow the ideas to flow. Sometimes it simply warms up those typing fingers but occasionally you strike gold. The more pointed your question, the more familiar your topic, the more likelihood you have of finding a precious brain wave. Everyone is familiar with the great idea that strikes you in the shower. This happens because you are letting your mind wander. Free writing taps into that function of your brain. I discovered pomodoros while watching my first PhD chat. The technique sits well with the way my mind works (probably developed from spending most of my life in schools and the education industry). My aim was to complete six pomodoros on my first day of writing. I wrote for 25 minutes and had a 5-10 minute break between each pomodoro. It is very difficult to sit and write for 25 minutes if you are not ready to do so. A lot of words can be written in 25 minutes of constant writing. I found the key value of the pomodoro technique was the break. Firstly, the technique reminded me to get up and move every 25 minutes. This is vital to good health. Writers who spend the day glued to the computer run a very real risk of Deep Vein Thrombosis (DVT). Trust me. I know. Secondly, the break gave me a chance to reflect on 25 minutes work and decide on the work's relevance to my dissertation. For the record, Critical DIscourse Analysis has NOTHING to do with my dissertation. The 25 minute writing time is valuable because, if I do get carried away, I have only wasted 25 minutes, not a whole day as many distractions/tangents have been known to do. Writing in pomodoros also allowed me to schedule other important activities during my writing day, such as attending to the needs of my babies in child care. One of the biggest time black holes during my PhD years has been my tendency to get distracted by all the interesting ideas I find in the literature. I go off track. 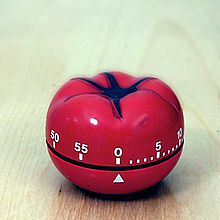 I am now such a pomodoros addict that I have been reading to a timer. I give myself 15 minutes to an article before I have to either find a specific, dissertation related use for it or lay it aside for another day. It took me 10 minutes of free writing, 2 pomodoros and an hour of reading to find my groove. I wasn't really very confident to write a major component of my thesis so decided to write some vingettes or short explanations that will be needed throughout the thesis. My preconditioning to DVT means exercise is an important part of my day. On my lunch break I went for a swim at the local pool. I figure that exercises like swimming and running allow a lot of time for my mind to tick over, process and formulate connections. I reached my aim of 6 pomodoros relatively easily. Only 3 hours of writing and I felt like I had really achieved something. What techniques do you use when writing? I'm a bit of a "process" junky so I will try anything.